Denver-based health-care mogul Kent Thiry runs DaVita, his multibillion-dollar kidney dialysis company, unlike anything the buttoned-down corporate world has ever seen. Are his carnival-like theatrics a stroke of genius, or are they designed to distract people from the hard truths about his business? Recently a bill was started in the Colorado statehouse to have automobile drivers become possible organ donors unless they opt-out. The bill was shelved due to "ethical" concerns. This incident very much highlights the need for more information for those who have concerns about this bill. So in an effort to enlighten, a list of myths and facts has been started about organ donation. ProPublica, Dec. 9, 2010, 2:03 p.m.
5:01 p.m.: This post has been updated. 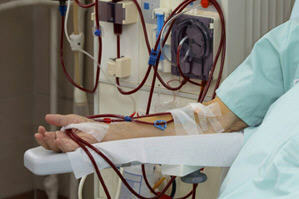 Patients treated at dialysis clinics run by the largest U.S. for-profit chains have a higher risk of death than patients treated by the biggest nonprofit chain, a study released today in the journal Health Services Research concludes. The outcome gaps are substantial: Patients at the largest for-profit chain were found to have a 19 percent higher risk of death than patients receiving care at the nonprofit; at the second-largest chain, the risk was 24 percent higher. In 1972, after a month of deliberation, Congress launched the nation's most ambitious experiment in universal health care: a change to the Social Security Act that granted comprehensive coverage under Medicare to virtually anyone diagnosed with kidney failure, regardless of age or income. It was a supremely hopeful moment. Although the technology to keep kidney patients alive through dialysis had arrived, it was still unattainable for all but a lucky few. At one hospital, a death panel -- or "God committee" in the parlance of the time -- was deciding who got it and who didn't. The new program would help about 11,000 Americans, just for starters. For a modest initial price tag of $135 million, it would cover not only their dialysis and transplants, but all of their medical needs. Some consider it the closest that the United States has come to socialized medicine.